Pastor Doug Snyder has been the Pastor of Faith Orthodox Presbyterian Church since it began back in May 1995. He was born and raised in Indiana County Pennsylvania. Shortly after graduating from high school he married his wife Darlene on February 15, 1969. They have three grown and married children and two beautiful granddaughters. Following high school Doug worked five years as a machinist for a local industrial products company. 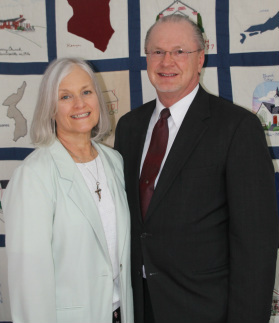 Shortly after starting college Indiana University of Pennsylvania, both Doug and Darlene committed their lives to Christ through the ministry of the Coalition for Christian Outreach that worked on the IUP campus. After two years of discipleship under this campus ministry, both Doug and Darlene joined the staff of the Coalition for Christian Outreach and worked with students on the IUP main campus in Indiana and its branch campus in Punxsutawney, PA for the next 11 years. During this 11 years of campus ministry Doug earned a Bachelors Degree in Business Administration from IUP and a Masters of Divinity Degree from the Reformed Presbyterian Theological Seminary in Pittsburgh, PA.
Doug was ordained to the Gospel Ministry in the Orthodox Presbyterian Church in January 1990 and served as pastor of an independent Reformed Congregation for 7 years before being called as an evangelist and church planter for the new Orthodox Presbyterian Church mission work in Indiana, PA in May 1995 which began meeting for worship at the Indiana YMCA. This mission church became an established church in 1996 and took the name of Faith Orthodox Presbyterian Church. Pastor Doug has a heart for people and the Reformed Faith and is excited when he can bring the two together.